So I had a lovely weekend in London. I'll tell you all about it once Ford figures out how to a) download pictures from her new camera and b) sends me the pictures. Stories are so much better with pictures. But first, Terminal 5, Heathrow. Big mess for those traveling with luggage. I found it lovely, having only a carryon. We arrived a bit late today in Kyiv, and when we got to the terminal, the line for immigration was terribly long. Up the stairs, looping around, a good hour wait or so. But I have a diplomatic passport, so, by the rules of the Ukrainian government, I jumped to the front of the 2nd furthest line to the left and was through immigration in minutes. Having just a carryon, I sauntered out to customs, flashed my passport again to avoid any customs check, and walked into the waiting throng of taxi drivers, people to meet loved ones, and various other people hanging about the arrivals area. Feeling quite good about my quick exit, I contemplated jumping on a bus to the metro to get home. But it was raining, and I had taken the metro TO the airport, and the Tube to the city and back to Heathrow in London, so I figured I was about $110 in the black at this point. Taxi it was. Feeling even better about myself, I settled into the car for the, hopefully, quick trip home. I slid in behind the driver as his car was parked up close against a railing and a garbage bin. As we drove out of the parking lot, I grabbed my book, and, figured I better buckle up. Four minutes later I was engrossed in my book, car speeding through the rainswept airport access road as the taxi driver slammed on the brakes and we started to fishtail. I looked up to see us bearing down on a complete jackass who had pulled out in front of us. I put my arms up against the seat back in front of me and, for some reason, thought, 'don't lock your elbows'. I'd never been in a car accident. We must have been going about 65 MPH when Andriy hit the breaks, 45 or 50 when we slammed into the rear of the idiot who had barely even accelerated out of his turn. Slammed forward, the seat belt did its job admirably, but my neck snapped forward and my teeth clicked together so hard I thought for sure I had broken, or ate least chipped, one or more. I'm okay, but in the immediate aftermath I figured it was just the adrenalin, and that once that stopped coursing through me I would start to feel it. The drivers of both cars were also okay, but my taxi was pretty crumpled in the front, and the back of the other car was completely smashed. Happy to say the engineers did their jobs and the passenger area was pretty intact. So my quick return home became 40 minutes standing on the side of the highway in the rain, waiting for the police, the insurance people, and a replacement driver for me. Ukrainian law requires drivers in an accident to not move their cars and wait for the police and insurance people (not that my taxi could have been driven anywhere). I talked to the embassy and found that, as a passenger, I could a) wait around, b) leave, or c) leave, but leave my phone number. The replacement driver turned out to be my original driver's father, who was more interested in sticking around to ensure his son wasn't found at fault (he wasn't at fault, as far as I saw). Finally, a third car pulled up, I gave my initial driver my cell number and name in case the police wanted to take my statement, and I got into the car with the driver and two Aerosvit flight attendants to go into the city. By this time, it was rush hour and my quick exit had turned into a more than two hour nightmare (including the fun 40 minutes in the rain). Throughout the jouney back into the city in the 2nd taxi I attempted to continue reading my book, but looked up with a start at every brake, lane change, even windshield wipe of the car. I made it home without further incident, and my friend Cliff was nice enough to invite me over for beer and pasta for dinner. Now I'm home, my neck hurts, my left knee hurts, I'm sore from the seat belt, and pissed off I didn't get delayed somewhere along my quick arrival to the taxi stand. But, all in all, it could have been worse. 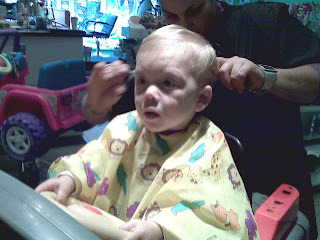 Meanwhile, Jack is already learning to be a menace on the road, multitasking by driving while getting his haircut in Larchmont today. At least he's got his eyes on the road. They get home Thursday morning.